Enrico Esu family were originally pastori/shepherds, who in the Sardinian tradition, created family settlements called ‘medau’, along with vineyards. Both the Pheonicians & Romans planted coastal footholds on the island, notably at Sulcis & Sant’Antioco, but never conquered the indigenous people who lived inland. 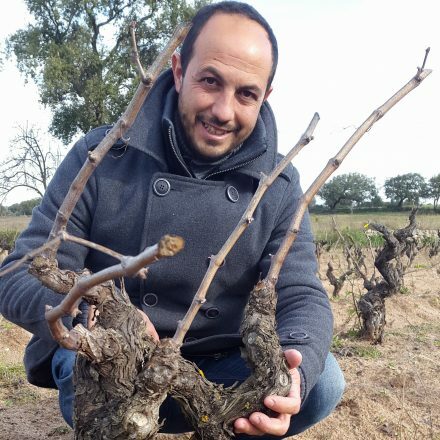 Enrico’s father Silvio – whom he refers to as a cross between a farmer and a miner – planted their 10 hectares of Carignano (aka Mazuelo) back in 1958. It’s a grape first propagated by the (Spanish) Bourbons during their four-hundred-year occupation of the island between the 14th and 18th century, indeed originally referred to as ‘Axina de Spagna’. Compared to the more commercially, volume driven neighbors reliant on spalliera/rows, vine clones & vigorous rootstocks that gave Carignano a bad name, the Esu family treasured the original, ancient, ‘alberello’ ungrafted/piede franco vines, with their loose bunches and look to perpetuate them on account of their excellent fruit. Following years of selling the (prized) fruit off, Enrico decided in 2013 to make the switch to bottling the wine under the estate label ‘Nerominiera’, so honouring the presence of the now silent coal mines. Vinified without oak, at the local cantina sociale (cooperative), Enrico made only 5000 bottles of his inaugural bottling’. From 2015, he began vinifying in his cantina (close to the family’s ‘Medau’) & released the first vintage of ‘Seruci’, the name of the mine where his father work his final shift. 2016 ‘Nerominiera’, Carignano del Sulcis, Carbonia – sporting smart new labels! c. 5k bottled Feb’18, tasted 1 May’18, 14%, the vintage 2016 in the SW zone of Sulcis, sardegna, was characterised by a dry summer followed by rain from mid Sept. This threatened to ruin the crop, so Enrico harvested slightly earlier (8th Sept for this wine), marginally reducing the alcohol but increasing the acidity/freshness of the wine. 100% Carignano from ungrafted vines. Hence: vibrant blackberry colour, the nose bright, energetic, with kirsch black cherry stone, a hint of hedgerow; to taste, crisp, fragrant lampone/Scottish raspberry, of blackberries & cream (but no oak! ), of iode, black pepper, rum raisin & choc fruit. Med-full, succulent, yet evidently enjoying thick skins, generous flesh, furry bramble/hedgerow fruit, crunch, silky/no existent tannins, lampone/violet fragrance, so true, pure & natural, yet precise & immensely gratifying! 2016 ‘Seruci’ Carignano del Sulcis, Carbonia – to be bottled June’18, using smart new labels & a wax top! Tasted finished sample 1 May’18, 14.86% abv, c. 1.2k bts to be produced; a wine name after the mine in which Enrico’s father once worked, but inspired by Giacomo Tachis who believed that Carignano benefited with wood ageing; harvested from the Esu family’s oldest, 4 alberello 100% Carignano vineyards (on granitic sand) close to the family ‘medau’, from 16th Sept. 2016 onwards, was fermented in open plastic tubs for 2 weeks using wild yeasts & little temperature control; the 2016 vintage indeed was aged for 12 months in four 9yo Saury barriques (ex Santardi) that Enrico chose personally. Indeed the influence of wood is very subtle: denser, darker inky red; less perfumed/pretty than the Nerominiera, it’s more of a smouldering embers, tapenade, rosemary, really old vine blueberry, sotto spirito fruit that swamps your senses! Deep dark blackberry, very furry, syrupy, rum raisin, hedgerow fruit. This is an extraordinary, almost Cannonau-esque, meatier, thick skinned, bready richness of this wine! Indeed it boasts a dry (syrupy) extract of 37grams/litre! (more than Montalcino!) Total tartaric acidity was at 5.3grams/litre. It’s so rich as to be spherical, heady, syrupy even, yet at the same time so pure, well-knit, energetic & exciting. There’s a lovely freshness to balance out the kirsch, brambly fruit. Majestic!